Pattern Cut Design S Discounts Apply ! 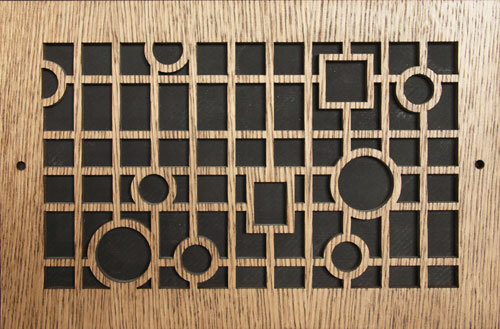 Pattern Cut wood return air wall grilles are a beautiful addition to any room. These wood return air wall grilles can be painted to match your walls or stained to match your trim. They come in 56 sizes, 26 designs, and 3 wood veneers ensuring you'll find the perfect grille for any decor. These wall grilles are shipped to you sanded and ready to be finished. They are cut from Baltic Birch ply and have a furniture grade veneer of either Oak, Maple, or Cherry. The manufacturer recommends the maple veneer if you will be painting the grille. On top of the 56 sizes listed on our site, the manufacturer also offers custom sizes. Call us at 800-504-5989 for a quote. You can also purchase an Adjustable Damper separately which will allow you to control the air flow. These wood return air wall grilles are measured by the size of the duct opening in your wall. Measure the size of the hole in inches (Width x Height) and order the corresponding size. Example: If the size of your duct opening measure 12" wide by 6" tall you will want to order the 12 x 6 wood return air grille. The faceplate of the grille will then be 1 3/4" larger than the duct (13 3/4" x 7 3/4" for this example). The faceplate is approximately 1/4" thick. These beautiful wood vents are made to order, they should ship in 7-15 business days. Pattern Cut Grilles are special order, non-returnable and cannot be canceled once payment is received. - Thin your primer. Be sure to choose a good oil, water, lacquer, or shellac based primer. - With a soft brush, work the primer over the surface of the grille taking care not to let drips build up in the edges. - Apply 2 coats of paint. - Allow to dry completely before installing. - Fill a large pan with stain. - Submerge the entire grille. - Wipe of excess stain and allow the grille to dry in an upright position for 24 hours. - Lay the grille flat and spray 2 - 3 coats of lacquer sanding sealer. - Gently sand the grille with a piece of 220 grit sandpaper. - Clean off the residue. - Lay the grille flat and spray 2 - 3 coats of clear lacquer. - Allow the grille to cure for at least 3 days before installing. These wall grilles are intended for use in the wall and ceiling only.